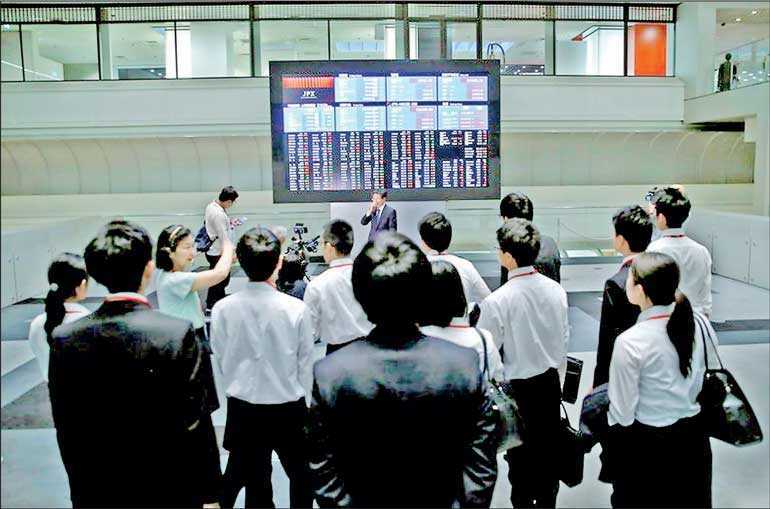 TOKYO (Reuters): Asian stocks extended gains on Tuesday as overnight strength on Wall Street and the Federal Reserve’s cautious turn underpinned appetite for riskier assets, while the dollar held firm on last week’s upbeat US data. European shares were expected to open higher, with financial spread-betters seeing Britain’s FTSE, France’s CAC, Germany’s DAX to tick up between 0.3 and 0.5% each. MSCI’s broadest index of Asia-Pacific shares outside Japan advanced 0.5% and hovered near its four-month high marked on Friday. Japan’s Nikkei average marked its highest level in seven weeks at one point but finished the day down 0.2%. Australian shares jumped 2%, with long-battered financials surging on short-covering after a special government-appointed inquiry excoriated Australia’s financial sector for misconduct but left the structure of the country’s powerful banks in place. The Cboe Volatility Index, Wall Street’s so-called “fear gauge,” dropped to 15.60, its lowest level in four months, on Monday. MSCI’s gauge of stocks across the globe reached a two-month high. It has risen more than 13% from its near two-year low in late December, helped by the Fed’s change of tack. Fed Chairman Jerome Powell has signalled its three-year tightening drive may be coming to an end amid a suddenly cloudy outlook for the US economy due to global growth concerns and the US-China trade dispute. Data announced on Friday showed US job growth surged in January while a key gauge of US manufacturing sector showed surprising resilience after December’s shocking fall, allaying fears the US economy might be losing momentum quickly. Hiroshi Nakamura, senior manager of investment planning at Mitsui Life Insurance, said financial markets’ positive reaction to the US data is diminishing with time, but hopes for a US-China trade deal “will continue to support markets until the two sides come to formal decisions”. The dollar held on to recent gains against its major peers as investors continued to lap-up Friday’s strong payrolls number and a manufacturing survey. The dollar’s index against six major currencies was little changed at 95.847, having gained 0.27% in the previous day. On Monday, sterling quickly erased brief gains following a newspaper report that goods shipped to Britain from the European Union could be waved through without checks in the event of a “no-deal” Brexit. The Australian dollar gained 0.5% to $0.7260, erasing earlier losses, after the Reserve Bank of Australia left policy unchanged at its first meeting this year but sounded less dovish than the markets had wagered on. Earlier on Tuesday, the Aussie fell as much as 0.5% after a slump in retail sales reinforced concerns about slowing growth in Australia. Traders’ focus quickly shifted to US President Donald Trump’s delayed State of the Union address, as well as US ISM’s non-manufacturing figures, also due later in the day. In commodity markets, oil prices inched up, buoyed by expectations of tightening global supply amid US sanctions on Venezuela and production cuts led by OPEC. US West Texas Intermediate (WTI) crude futures rose 0.5% to $54.82 a barrel, after hitting a 2-12-month high of $55.75 in the previous session, while Brent crude futures were last up 0.3% at $62.73.